Less than 24 hours ago I was ambling from one plane to another connecting flight, through another security line, through customs, and then to baggage claim. Now, 5 minutes ago I finished my first day of class—my final semester of my undergraduate career. But, I’m not tired. I’m not exhausted. Oddly enough I’m not even too stressed, considering the situation. I am energized. I am refreshed. I am reinvigorated. I am calmed by an astute sense that everything will work out, and that I am on the right path. This clarity came from a mere 10 days in Bolivia with Amizade. Bolivia was my cure for the uncertainty my senior year brought with it. I came back fully reassured that I want to continue studying Spanish; that I want to continue to foster a relationship with and support Amizade; and that Bolivia is Latin America’s best kept secret. I participated in the Winter Break Service-Learning Course in Bolivia, Andean Culture and Creative Writing in Bolivia. It’s all still so fresh in my head, yet simultaneously distant—going from summer in the southern hemisphere to winter in Pittsburgh will do that to anyone. So, I’ve decided to put my new writing prowess to use, and jot down a few select moments before any detail can slip away. 5 other students from the University of Pittsburgh and West Virginia University, our creative writing professor, and I left for Bolivia the day after Christmas. The long hours of travel bound us, and by the time we arrived in Cochabamba we were like old friends. For four days we helped do construction at the Mallco Rancho Community Center–mostly consisting of cement work and re-bar. We were the first Amizade group to work on this project. We chatted and joked in broken Spanish with our maestros, saw walls go up and bits of re-bar become beams, answered a myriad of questions from curious kids (about Michael Jackson, blue eyes, and nose rings) and repeatedly thanked the local women who insisted upon cooking us meals at the end of each day. Even with cement in our hair and callouses on our palms, no one wanted to leave. On our final day we took photos, and promised to send copies. We started kicking a soccer ball around with the kids, pretending that our Trufi driver, Raul, wasn’t already there, ready to take us to our hostel. We just kept talking, thanking each other, and shaking hands. Then one mother, her 10 month old son Abner on her hip, kissed my cheek and told me I had to come back to see Abner walk. I didn’t hesitate—and didn’t lie—when I replied that I would be back as soon as possible. After all, our visas are good for 5 years. Who’s with me? 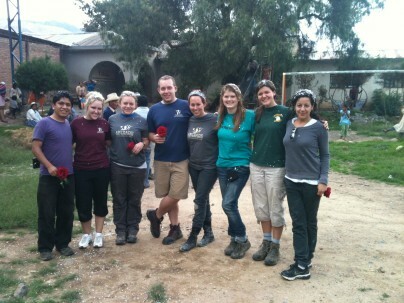 -Allie Bustin, Amizade intern and recent participant in Bolivia. Learn more about Amizade in Bolivia.